A lice infestation can be a parent’s worst nightmare, especially if you have more than one school-aged child. 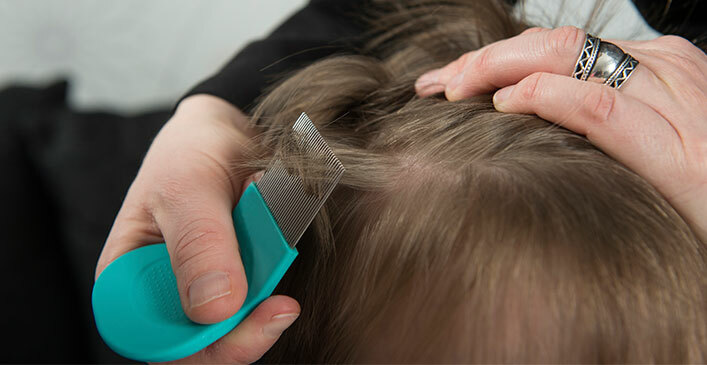 Lice spread easily from person to person, with schools or day care centers often acting as a breeding ground for lice. The tiny sesame-seed-sized parasites can live up to two days outside of a person’s scalp and may live on hairbrushes or hats, getting transferred from one host to another where they can lay new eggs. The result is an increasingly bothersome situation that can only get worse if it’s overlooked or untreated. Sometimes children can have lice for weeks without any symptoms or have other conditions that may mimic the symptoms of lice. Before starting any type of lice treatment, ensure your child is properly diagnosed by a school nurse or family doctor. The symptoms of a head lice infestation may include itchiness of the scalp, bumps on the neck or hairline, and a crawling sensation on the scalp. You will also be able to see the tiny yellow, tan or brown eggs, which sit on the root of a hair follicle. However, to confirm an infestation, an adult louse has to be identified through the process of detection combing. Detection combing involves using a special fine tooth comb to comb through wet hair, trapping even the smallest of adult head lice. If an adult louse is spotted, and the diagnosis is confirmed by a doctor, be sure to notify your child’s school or other facilities where other children may have come in contact with them. After a head lice diagnosis, your child may be prescribed an over-the-counter or prescription medication depending on the severity of the infestation. Lice treatments come in the form of medicated shampoos, cream rinses, lotions or oral solutions. Make sure to follow the directions precisely to reduce the risk of reinfestation. It’s also important to ensure the medication you use will kill the adult lice in addition to the nits and eggs. Lice have a life cycle of approximately nine days, so the earlier the treatment is started, the better. Some medications may be too harsh for young children. If that is the case with your child, hand removal may be necessary. The same detection combing method is used with wet hair to spot and eradicate the eggs and lice. Removal should be done every week for at least three weeks to make sure the lice do not return. If a lice diagnosis is confirmed, inspect other family members for infestation and treat them at the same time. Getting rid of all the lice at once will help prevent further recurrences. Wash all linens, towels and clothing the infected person has come in contact with in very hot water to kill any eggs or lice. Hair accessories, brushes and combs should either be soaked in lice medication or alcohol, or thrown away. Carpets, rugs and upholstered furniture should also be vacuumed right away, especially if your child is still crawling or often plays on the floor. Depending on what stage the infestation was when treated, retreatment may be necessary. To ensure reinfestation does not occur, shampoos containing mango, rosemary or tea tree oil can be used to deter lice. Your child’s school or daycare center should be notified if your child has lice. Many schools have a “no nit” policy before a child may come back to school. As lice is a common occurrence during childhood, the school or facility will likely already have policies on disinfecting toys and other items affected children may have come in contact with. Nevertheless, it doesn’t hurt to find out what those policies are. For example, if your child has naptime at school, find out if the teachers disinfect the mats between uses or if the mats are shared. Some children may become upset or agitated by their run-in with lice. Children may tease them at school or say they are dirty or gross. Data suggests that the opposite is actually true: lice prefer clean, shiny hair to lay their eggs in. It’s important to have a conversation with your child so they understand what is happening and how the infestation occurred. Remind them not to share hairbrushes, combs, hair accessories or hats with other children. Educate them on how head to head contact encourages the spread of lice. Like you, after one experience with lice, they will likely never want it to happen again.